Our Super SMT Component Enclosure is the world's only one which has > 100 compartments for enclosing SMT components, such as chip resistors, capacitors, inductors, ICs, etc. 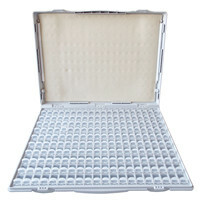 This enclosure has 128 individually lidded compartments, all covered by a top cover. There is a foam pad under the top cover, which presses down all the 128 lids onto their closing positions, thus, they can tolerate strong vibration and shock without opening, so that the parts inside will never be leaked out. The difference between SK128 and SK128B is that the former has square lids and doesn't leak components of larger size, such as 1206, but would leak small size ones. The latter has round lids and would not leak small size components down to 0402.